Bethel Bible Institute, Abbotsford, BC. Source: MHSBC Archives Fond 65-S20.2-2010.087.004. The need for a centralized school that "would be the guardian of traditional Mennonite faith" was seriously proposed at the 1937 Ministers Conference of the Conference of United Mennonite Church of BC. At that time several local Mennonite congregations in British Columbia had established Bible schools, popularly known as "Religionsschulen" or schools of religious instruction, and others were established in following years. These were located in Abbotsford, Coghlan, Sardis and Yarrow, with Coghlan having commenced operations in 1939. Under the gifted leadership of Nicolai W. Bahnmann (1879-1945), a graduate of the Pedagogical School in Halbstadt (Russia) and student at the Basel Bible School, the initiative in Coghlan showed considerable promise. In its first year, 22 young people enrolled in courses studying the Bible, Church, and Mennonite History. The three teachers, Bahnmann, J. D. Jantzen, and A. J. Jantzen, volunteered their time to teach over three and a half months, and students paid no tuition. A society was formed in 1940 to run the school for a three-year period until the Conference assumed full responsibility for the school in 1943. In 1940, delegates at the annual general meeting of the Conference instructed the Bible School Committee to plan for a single, integrated school. 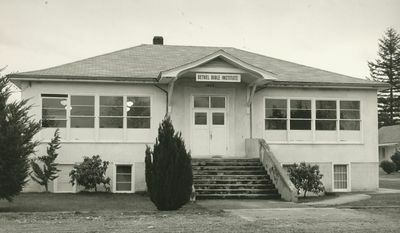 Subsequently, a four acre tract of land was purchased next to the West Abbotsford Mennonite Church and Bethel Bible Institute was launched in 1946. A girls' dormitory was built immediately, and in 1947 an administration building was completed. Over the next two decades Bethel developed a strong school identity, although student enrollment tended to fluctuate with the highest number reaching 61 in the 1951-52 school year and the lowest 19, in 1955-56. The school produced an annual yearbook (Echoes of Bethel), a newsletter (Contact), and developed an alumni association. Bethel Bible Institute served some 600 students, including 100 graduates, and was a vibrant reflection of the churches it served, namely helping "the local church equip its members for work in the various avenues of Christian service." Cornelia Lehn notes in Frontier Challenge that by 1953 every congregation in the Conference had at least one or more students at Bethel. Over the years some 31 teachers taught at Bethel. Two developments in the early 1950s sent shock waves through the school. The withdrawal of the West Abbotsford Mennonite Church from the Conference drastically affected student enrollment. Moreover, the perceived growing diversity of theological perspectives among faculty further eroded constituency confidence in Bethel. It was felt by some constituents that the fundamentalist and dispensationalist views among teaching faculty were inconsistent with Anabaptism, leaving the school with no clear theological direction. To the surprise of many delegates at the 1970 annual Conference, the Bethel Bible Institute Committee recommended amalgamation with the Mennonite Brethren Bible Institute, thus giving birth to Columbia Bible Institute. It would take some time before the fears of many MC constituents regarding the loss of denominational identity and the prospect of working so intimately with the MBs would be quieted. Nevertheless, as time and cooperative experience have shown, Columbia Bible Institute represented a healthy and sustaining inter-Mennonite vision, serving the needs of young people in both denominations. Gunther, Phil. The Story of the Bethel Bible Institute. Abbotsford, B.C. 1985. Lehn, Cornelia. Frontier Challenge: A Story of the Conference of Mennonites in B.C. [Clearbrook, B. C.: The Conference], 1990. Schmidt, George. "Columbia Bible Institute: Paradox of Brotherhood and Walls." Bellingham: Western Washington University, Senior Essay, 1977. Giesbrecht, David and Richard D. Thiessen. "Bethel Bible Institute (Abbotsford, British Columbia, Canada)." Global Anabaptist Mennonite Encyclopedia Online. February 2012. Web. 24 Apr 2019. http://gameo.org/index.php?title=Bethel_Bible_Institute_(Abbotsford,_British_Columbia,_Canada)&oldid=136190. Giesbrecht, David and Richard D. Thiessen. (February 2012). Bethel Bible Institute (Abbotsford, British Columbia, Canada). Global Anabaptist Mennonite Encyclopedia Online. Retrieved 24 April 2019, from http://gameo.org/index.php?title=Bethel_Bible_Institute_(Abbotsford,_British_Columbia,_Canada)&oldid=136190. This page was last modified on 5 October 2016, at 19:56.